it’s Farm Market season again! Lettuce, spinach, parsley, strawberries, blueberries, peas, kettle corn (for me! ), pomegranate lemonade (for me!) – did I miss anything? It’s Saturday, and it’s the first Saturday of the downtown farmers’ market. It’s also hot. Hot, muggy, steamy, sweaty. I heard several little kiddos complaining that they couldn’t walk anymore or that they were hot and sweaty. I saw even more young ones with beverages in hand. Families were smart and kept themselves and their kids hydrated. But other than that, it was a normal and pleasant market. I got a good parking space in my usual ramp, there was still time on the meter, and I grabbed my rolling bag and headed out to stock up on good food for the family. I may have come back with more food than planned and a lighter wallet (dropped tips in three buskers’ cases), but it was a good First Market of the Season. However, prepping is a challenge because we have no kitchen. I have no sink. Half of the colanders and bowls I usually use are stored in the basement. My favorite knife for shelling peas is also stored somewhere – where, I wish I knew. I rinsed the lettuce and spinach in big colanders with the hose – yes, you heard me, the garden hose. The peas were small enough to rinse in the bathroom sink. 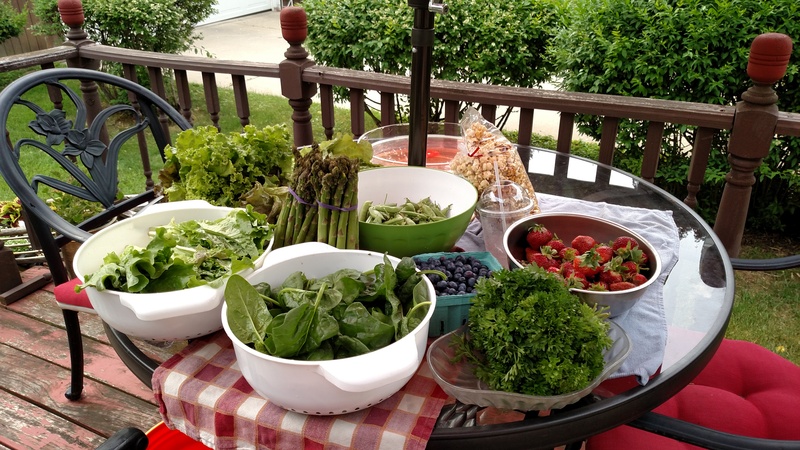 I had to set aside the strawberries and the asparagus – just no time to figure out how and where to get them cut up and cleaned. The next few days may be ridiculously hot. I can spend my time inside, prepping strawberries and asparagus. This entry was posted in family life this old house, kitchen stories and tagged it's not easy being green, it's the economy, Life is good. by Daisy. Bookmark the permalink. I’m impressed with your willpower in not just eating all the strawberries on the way home. The first strawberries of the season are one of the best things about June.